Salford Red Devils came from behind to beat Hull Kingston Rovers courtesy of a stunning second-half turnaround at Craven Park. 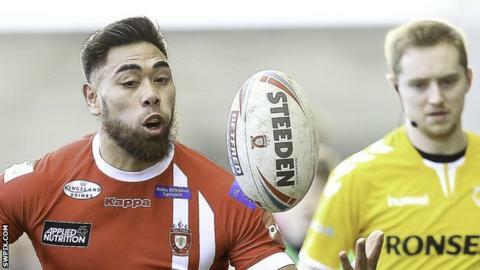 Weller Hauraki opened the scoring for Rovers against his former club but Rob Lui soon touched down for Salford. Josh Jones put Salford ahead but the hosts fought back through Craig Hall, George Lawler and Jimmy Keinhorst. However, the Red Devils rallied as Derrell Olpherts, Ken Sio and Joey Lussick helped them to victory. Salford came into the match off the back of a heavy defeat by Leeds Rhinos and they got off to a poor start when Hauraki sent the hosts ahead early on. Despite Lui and Jones combining to give the Red Devils a short-lived lead, Hull tightened their grip on the game with a strong end to the second half, with three tries in nine minutes. Rovers had Joel Tomkins back from a concussion and he almost wrapped up the win for Rovers late on when he went over, but Jackson Hastings put in a fine tackle to deny him. Sio's late try for Salford put them back in it and Lussick's 70th-minute touchdown capped off a remarkable comeback for the visitors, who kept Rovers scoreless after the break and atoned for an error-ridden first 40 minutes. "To turn the tide the way we did shows real good character in the team. "I just felt at half-time, if we cut the errors out, we'd win the game. "It's a big one for us. I don't think many teams will come here and win. KR are a good team, they play a great style of football." "We're all very disappointed. The problem was that we stopped playing. "We did nothing in the first 15 minutes of the second half, we threw no shape, didn't test them at all and they wore us down. "We tried to defend the lead and we cannot do that against a big strong side like Salford." Hull KR: Hall, Keinhorst, Shaw, McGuire, Mulhern, Masoe, Tomkins, Hauraki, Lee, Lawler, Linnett, Drinkwater, Dagger. Replacements: Garbutt, Atkin, Addy, Lannon. Salford: Evalds, Welham, Sa'u, Lui, Mossop, Dudson, Jones, Griffin, Lussick, Olpherts, Sio, Turgut, Hastings. Replacements: Burke, McCarthy, Tomkins, Murray.